Proceedings - Crude Oil Exports and Shipping Constraints in the Global Market. Empirical Evidence Explaining Global Crude Price Differentials. Proceedings - A Secured Energy Future for U.S.A.: Myth or Truth? 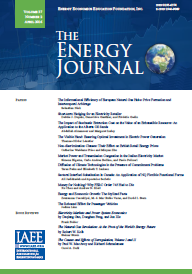 Published in Volume24, Number 2 of The Quarterly Journal of the IAEE's Energy Economics Education Foundation.